Refinancing your current mortgage can be a smart decision for many American homeowners; however, sometimes it's not as easy as it sounds. We are here to help with all of your refinancing needs. ClearPath Lending Inc. provides multiple refinance products and options to its borrowers across the country with a specialty in: VA, FHA, and Conventional home loan products. If you're unsure if refinancing is the right decision for you give us a call at (855) 866-5363 and a licensed mortgage banker will answer any questions you may have. More of a numbers person? Use one of our Mortgage Calculators to find out how much you could save by refinancing. Switch from an adjustable-rate mortgage to a fixed-rate mortgage to lock in a potential lower rate and feel at ease with a fixed payment for years to come. Switch from a fixed rate to an adjustable-rate and take advantage of potentially lower rates and payments for a brief period. Stuck with a high-interest rate? Lower your interest rate and move into something a little more comfortable, which could save you hundreds of dollars each year. 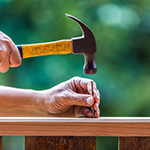 Typically, borrowers will go with the cash-out option when looking to make some home improvements, reduce credit card debt, down payment on an investment property or any financial need you have. Looking to pay off your mortgage in less than 30 years? Refinancing to a 10-year or 15-year fixed loan can be a great option for many homeowners to take years off their mortgage. How Much Will I Save By Refinancing?